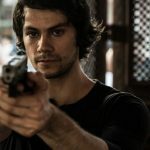 With the release of American Assassin starring Michael Keaton and Dylan O’Brien, it’s time for Croydon to celebrate its role in the big-budget production. Croydon arranged for the whole of St George’s Walk, including every single shop, to be bought up for a week, and transformed into an Istanbul quarter. This didn’t just include the elaborate sets and cars, it included about 200 Turkish speaking extras. FilmFixer manages the film office service in Croydon. FilmFixer director Andrew Pavord said, “For the duration, St George’s Walk was transformed into shisha shops and Turkish restaurants, populated by 200 Turkish speakers, all in costume, serving real food and smoking real pipes. The smells and sounds were completely authentic. “Dylan O’Brien walks through the bustle into the restaurant. Then the scene unfolds into an elaborate chase, with special operatives hoofing after him. We were happy that Croydon was able to meet this extensive location brief. And we’re even more happy that the production brought in five film students, all but one from Croydon College, for a week of work experience. “I really hope that because this is a big scale set and I’ve been doing lots of different things, it will show just what I’m capable of and help me get work in the business when I finish my course,” she said.